On Thursday we took the fishing club from camp harbor view on a fishing trip. The trip was so exciting and full of so many surprises. We brought 12 kids and two Camp Harbor View staff members. The day was a roller coaster for a couple of reasons because in total we caught about 10 fish. 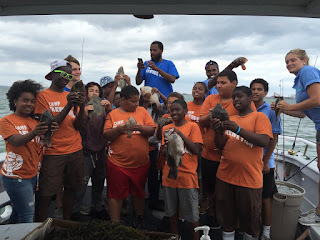 The kids caught multiple flounders and Skates and most importantly, a huge Black Fish. The boy who caught it, Corey, was just overwhelmed with excitement as he held his fish up for a photo. All of the children were having a great time no matter what they caught. Some kids were even excited about catching seaweed! But while most kids were having fun catching fish, one boy named Trey wasn’t having much luck. I was sitting with him and it was my job that day to help him fish and have fun. We were talking about school and summer and he was such a sweet and curious boy. While he was sitting with his rod out on the water he was starting to give up because his fellow campers were catching fish every 5 minutes. At one point he wanted to give up and he looked so sad until all of a sudden his rod moved...almost every other camper had caught a fish at this point so the excitement on his face really made my day. He ended up catching a Skate that we couldn't keep but he didn’t care because he had finally reached his goal. I, on the other hand, was not as fortunate as Trey. I was holding onto a rod in the same area for almost an hour but had no such luck. All of the other kids were catching fish and I’ll admit that I was becoming discouraged so I gave my rod to Corey. After about 2 minutes, Corey caught a flounder with the rod that I gave him. I was sad but now I know what I need to do next time and I can’t to try again. Overall the day was great. The kids had a blast and so did all of the staff. Almost everybody on that boat got to do something that they had never done before and that’s what really made the trip memorable.